Cutlery Caddy Can Be Used On The Traytop For Conventional Or Room Service Meal Delivery. Cutlery Caddy are made of paper for long lasting durability and dependability. Unique printed sleeve pre-loaded with 2 Ply trimline facial quality tissue napkin. Insert plastic or stainless utensils for clean, sanitary presentation. Cuts labor costs for wrapping utensils and increases trayline efficiency. 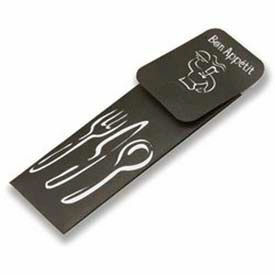 Eliminates loss of utensils and condiments during transport. We Do Not Accept Returns On Any Dinex Equipment Or Dinex Custom Products. Please Contact Your Local Dinex Rep To Ensure Order Accuracy Prior To Ordering. Color finishes are Black, Cranberry and White. Size is 19 in. W x 16 in. D x 10 in. H. Case quantity is 1.